Bold face type indicates revisions to the Wild Free Roaming Horse and Burro Act (Public Law 92-195). Sections 2. and 3. were modified by the Public Rangelands Improvement Act of 1978; Section 9. was modified by the Federal Land Policy and Management Act of 1976. To require the protection, management, and control of wild free-roaming horses and burros on public lands. Be it enacted by the Senate and House of Representatives of the United States of America in Congress assembled, That Congress finds and declares that wild free-roaming horses and burros are living symbols of the historic and pioneer spirit of the West; that they contribute to the diversity of life forms within the Nation and enrich the lives of the American people; and that these horses and burros are fast disappearing from the American scene. It is the policy of Congress that wild free-roaming horses and burros shall be protected from capture, branding, harassment, or death; and to accomplish this they are to be considered in the area where presently found, as an integral part of the natural system of the public lands. “public lands” means any lands administered by the Secretary of the Interior through the Bureau of Land Management or by the Secretary of Agriculture through the Forest Service. “excess animals” means wild free-roaming horses or burros (1) which have been removed from an area by the Secretary pursuant to application law or, (2) which must be removed from an area in order to preserve and maintain a thriving natural ecological balance and multiple-use relationship in that area. All wild free-roaming horses and burros are hereby declared to be under the jurisdiction of the Secretary for the purpose of management and protection in accordance with the provisions of this Act. The Secretary is authorized and directed to protect and manage wild free-roaming horses and burros as components of the public lands, and he may designate and maintain specific ranges on public lands as sanctuaries for their protection and preservation, where the Secretary after consultation with the wildlife agency of the State wherein any such range is proposed and with the Advisory Board established in section 7 of this Act deems such action desirable. The Secretary shall manage wild free-roaming horses and burros in a manner that is designed to achieve and maintain a thriving natural ecological balance on the public lands. He shall consider the recommendations of qualified scientists in the field of biology and ecology, some of whom shall be independent of both Federal and State agencies and may include members of the Advisory Board established in section 7 of this Act. All management activities shall be at the minimal feasible level and shall be carried out in consultation with the wildlife agency of the State wherein such lands are located in order to protect the natural ecological balance of all wildlife species which inhabit such lands, particularly endangered wildlife species. Any adjustments in forage allocations on any such lands shall take into consideration the needs of other wildlife species which inhabit such lands. The Secretary shall maintain a current inventory of wild free-roaming horses and burros on given areas of the public lands. The purpose of such inventory shall be to: make determinations as to whether and where an overpopulation exists and whether action should be taken to remove excess animals; determine appropriate management levels of wild free-roaming horses and burros on these areas of the public lands; and determine whether appropriate management levels should be achieved by the removal or destruction of excess animals, or other options (such as sterilization, or natural controls on population levels). In making such determinations the Secretary shall consult with the United States Fish and Wildlife Service, wildlife agencies of the State or States wherein wild free-roaming horses and burros are located, such individuals independent of Federal and State government as have been recommended by the National Academy of Sciences, and such other individuals whom he determines have scientific expertise and special knowledge of wild horse and burro protection, wild-life management and animal husbandry as related to rangeland management. 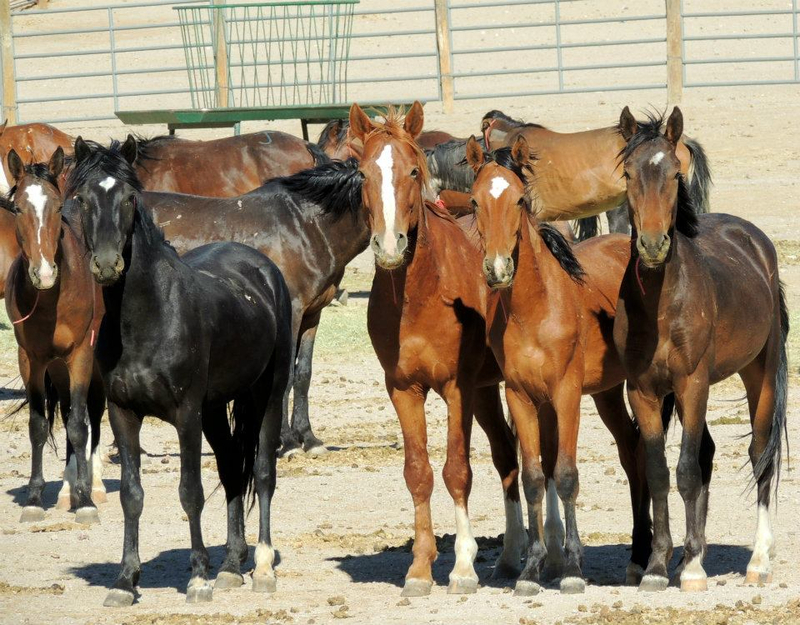 The Secretary shall cause additional excess wild free roaming horses and burros for which an adoption demand by qualified individuals does not exist to be destroyed in the most humane and cost efficient manner possible. For the purpose of furthering knowledge of wild horse and burro population dynamics and their interrelationship with wildlife, forage and water resources, and assisting him in making his determination as to what constitutes excess animals, the Secretary shall contract for a research study of such animals with such individuals independent of Federal and State government as may be recommended by the National Academy of Sciences for having scientific expertise and special knowledge of wild horse and burro protection, wildlife management and animal husbandry as related to rangeland management. The terms and outline of such research study shall be determined by a redesign panel to be appointed by the President of the National Academy of Sciences. Such study shall be completed and submitted by the Secretary to the Senate and House of Representatives on or before January 1, 1983. Where excess animals have been transferred to a qualified individual for adoption and private maintenance pursuant to this Act and the Secretary determines that such individual has provided humane conditions, treatment and care for such animal or animals for a period of one year, the Secretary is authorized upon application by the transferee to grant title to not more than four animals to the transferee at the end of the one-year period. Wild free-roaming horses and burros or their remains shall lose their status as wild free-roaming horses or burros and shall no longer be considered as falling within the purview of this Act- (1) upon passage of title pursuant to subsection (c) except for the limitation of subsection (c)(1) of this section, or (2) if they have been transferred for private maintenance or adoption pursuant to this Act and die of natural causes before passage of title; or (3) upon destruction by the Secretary or his designee pursuant to subsection (b) of this section; or (4) if they die of natural causes on the public lands or on private lands where maintained thereon pursuant to section 4 and disposal is authorized by the Secretary or his designee; or (5) upon destruction or death for purposes of or incident to the program authorized in section 3 of this Act; Provided, That no wild free-roaming horse or burro or its remains may be sold or transferred for consideration for processing into commercial products. Sec. 4. If wild free-roaming horses or burros stray from public lands onto privately owned land, the owners of such land may inform the nearest Federal marshall or agent of the Secretary, who shall arrange to have the animals removed. In no event shall such wild free-roaming horses and burros be destroyed except by the agents of the Secretary. Nothing in this section shall be construed to prohibit a private landowner from maintaining wild free-roaming horses or burros on his private lands, or lands leased from the Government, if he does so in a manner that protects them from harassment, and if the animals were not willfully removed or enticed from the public lands. Any individuals who maintain such wild free-roaming horses and burros on their private lands or lands leased from the Government shall notify the appropriate agent of the Secretary and supply him with a reasonable approximation of the number of animals so maintained.Sec. 5. A person claiming ownership of a horse or burro on the public lands shall be entitled to recover it only if recovery is permissible under the branding and estray laws of the State in which the animal is found.Sec. 6. The Secretary is authorized to enter into cooperative agreements with other landowners and with the State and local governmental agencies and may issue such regulations as he deems necessary for the furtherance of the purposes of this Act.Sec. 7. The Secretary of the Interior and the Secretary of Agriculture are authorized and directed to appoint a joint advisory board of not more than nine members to advise them on any matter relating to wild free-roaming horses and burros and their management and protection. They shall select as advisers persons who are not employees of the Federal or State Governments and whom they deem to have special knowledge about protection of horses and burros, management of wildlife, animal husbandry, or natural resources management. Members of this board shall not receive reimbursement except for travel and other expenditures necessary in connection with their services.Sec. 8.
willfully violates a regulation issued pursuant to this Act, shall be subject to a fine of not more than $2,000, or imprisonment for not more than one year, or both. Any person so charged with such violation by the Secretary may be tried and sentenced by any United States commissioner or magistrate designated for that purpose by the court by which he was appointed, in the same manner and subject to the same conditions as provided for in section 3401, title 18, United States Code. Any employee designated by the Secretary of the Interior or the Secretary of Agriculture shall have power, without warrant, to arrest any person committing in the presence of such employee a violation of this Act or any regulation made pursuant thereto, and to take such person immediately for examination or trail before an officer or court of competent jurisdiction, and shall have power to execute any warrant or other process issued by an officer or court of competent jurisdiction to enforce the provisions of this Act or regulations made pursuant thereto. Any judge of a court established under the laws of the United States, or any United States magistrate may, within his respective jurisdiction, upon proper oath or affirmation showing probable cause, issue warrants in all such cases. Sec. 9. In administering this Act, the Secretary may use or contract for the use of helicopters or, for the purpose of transporting captured animals, motor vehicles. Such use shall be undertaken only after a public hearing and under the direct supervision of the Secretary or of a duly authorized official or employee of the Department. The provisions of subsection (a) of the Act of September 8, 1959 (73 Stat. 470; 18 U.S.C. 47(a)) shall not be applicable to such use. Such use shall be in accordance with humane procedures prescribed by the Secretary.Sec. 10. Nothing in this Act shall be construed to authorize the Secretary to relocate wild free-roaming horses or burros to areas of the public lands where they do not presently exist.Sec. 11. After the expiration of thirty calendar months following the date of enactment of this Act, and every twenty-four calendar months thereafter, the Secretaries of the Interior and Agriculture will submit to Congress a joint report on the administration of this Act, including a summary of enforcement and/or other actions taken thereunder, costs, and such recommendations for legislative or other actions he might deem appropriate.The Secretary of the Interior and the Secretary of Agriculture shall consult with respect to the implementation and enforcement of this Act and to the maximum feasible extent coordinate the activities of their respective departments and in the implementation and enforcement of this Act. The Secretaries are authorized and directed to undertake those studies of the habits of wild free-roaming horses and burros that they may deem necessary in order to carry out the provisions of this Act.